Strong and secure, will not shake out, will not jam, better than bowline. Use Method #4 (video) instead of Bowline. Strong, easy to tie, but can shake out if not locked. Great knot for halyards, securing fenders to lifelines, etc, but can jam. Use for securing ropes to cleats. 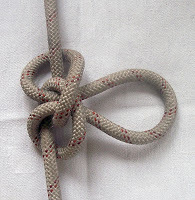 Good stopper knot, can be adapted for other purposes. Great for securing one rope to another rope under load. Quick-release knot for sail ties and bags, not secure. Also useful as temporary stopper knot; e.g., for spinnaker sheet at a block (animation). Famously used for tying reef points in sails. Sheet Bend is deliberately omitted because it's weak and unreliable. Two Alpine Butterflys tied together or two bowlines tied to each other (Bowline Bend) are better alternatives, or for ropes of roughly similar thickness the Alpine Butterfly Bend. What about the Water bowline (or even a double bowline) instead of the alpine butterfly? I've never heard of sailors using the alpine butterfly, so I'm interested why you do (or why they don't). And why not a double sheet bend instead of the sheet bend, or would you still use two loop knots?